While released earlier this year, Pragmatic Play’s Madame Destiny fits nicely into the Halloween slots genre. Set deep in a spooky forest, there’s a strange Romani wagon, and in that wagon is a powerful Oracle. Want to know the future? A 10p bet will get you inside. This is possibly the most volatile game around this Halloween, and that’s the scary part! You may pay to see the bonus, but this slots full of multipliers and a 900 x stake jackpot! The Madame Destiny slot is a 10 pay line online casino game from developers Pragmatic Play. With a fortune teller theme and plenty of creepy undertones, the game is well suited within the Halloween slots genre. It’s also the first game I’ve found this Halloween with a paytable that shows clear prizes in actual money as opposed to coin value. Now that’s very helpful. Pragmatic Play builds some good slots and Madame Destiny follows in their footsteps. The game is very mysterious with lots of Halloween hallmarks, the witch, owl and black cat etc. Sound effects and graphics are strong as is the animation and finer details, look at the fog of time rising through the forest. Built using the latest HTML-5 software, you can play Madame Destiny on mobile, tablet or desktop. Real money gaming begins at 10p a spin and the maximum bet is £50. The payout rate for the slot is 96.50% RTP while the jackpot is 900 x your betting stake. (5 of a kind Madame Destiny Wilds). Some of the reasons to play Madame Destiny include a huge paytable of 12 symbols and features that multiply in-play wins. Wild wins are multiplied by 2 while free spin wins are multiplied by 3. Plus, there’s an increase in the chance of re-triggering free spins with every single win within that bonus. Also worth point out, this is Pragmatic Play’s highest volatile game to date and our scariest Halloween slot for precisely that reason. Why? Because while the bonuses can pay huge sums of money, getting them out of the Oracle’s crystal ball is easier said than done. That said, the Madame Destiny slot is a very intriguing and mysterious game for that reason, and no one can predict the future! Or can she? My review highlights include multipliers, a very good mobile slot variant, cash values on the paytable and a real graphical charm. This game is the multiplier slot of Halloween. That’s the magic with Madame Destiny, the multiplication of wins. 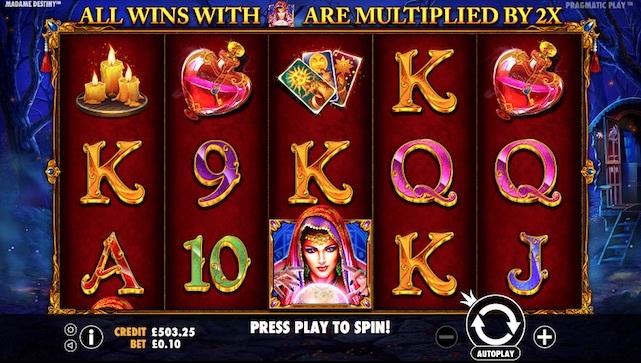 Pragmatic Play uses a smart game engine with two different multipliers, a base game Wild Oracle and a Free Spins Bonus. Spin the reels and everything twinkles, the graphics, the sound effects, it’s all very spooky. But wait, it’s Madame Destiny, the Wild Oracle. If she appears, you’ll hear the sound of coins as the reel next door supercharges. If you’re lucky enough to make a win with the Wild Oracle, she’ll then double it. A 2 x multiplier on any wild is extremely lucrative for a slot game. We like it very much. The fog of time is the power that Madame Destiny unleashes from her crystal ball. Or another way of putting it, it’s the slots free spins bonus round. And it’s very nicely done. But you’ll need 3 x Scatter symbols to trigger this bonus. And here’s where the high volatility kicks in. You could be spending a few quid in bets trying to find these crystal balls. 3 or more scatter symbols on the reels will trigger the 15 free spins bonus. When this happens, there’s a very odd bell sound before the fun begins. At this point the reels don’t spin, they appear out of the fog. It’s all very mysterious, it’s all very Halloween. But the biggest surprise of all is that all wins are multiplied by 3. In the free play mode we tested this bonus at £0.10 a spin and won over £5.00 so the returns can be decent. But I can’t remember how many spins we played to trigger this feature! Another major selling point is that you can re-trigger the free spins in Madame Destiny and access a no limits level. I’ll mention high volatility because Pragmatic Play mentions it in the paytable information. Pragmatic Play uses a 10 level points system on the degree of volatility built within their games. 10 being the highest volatility of them all. Guess what? The Madam Destiny Slot is a big level tenner! I’ll word it exactly how they word it. High volatility games pay out less often on average but the chance to hit big wins in a short time span is higher. In plain English, you can win more but you’ll pay more trying to win more! I guess it all evens out in the end, but hopefully in our favour. Want to read about some other Halloween slot features? Lightning Horseman offers the Lightning Re-Spin while Wolf Hunters feature characters that attack the werewolf symbols. How much can you win playing Madame Destiny Slot? Thankfully due to Pragmatic Play’s cool game design, you can switch this slot between coins and cash. That means working out How much you can win is simple. As with our other online slot reviews, we’ll look at the pay table for the smallest and biggest bets. £0.10 and £50 a spin respectively. 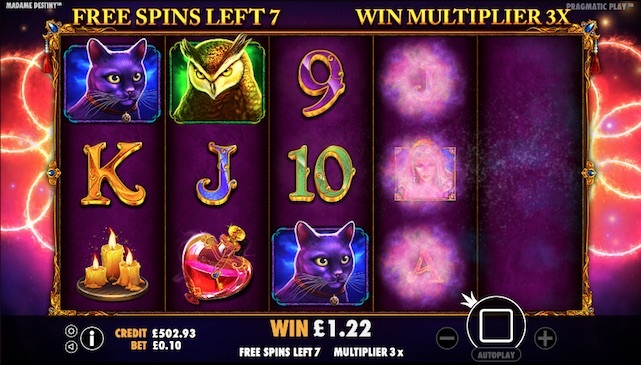 Play this spooky slot game for 10p a spin and you could win: £0.02 for 2 x 9 symbols (lowest prize on the paytable), £0.75 for 4 x tarot cards or £7.50 for 5 x creepy cats. 5 x bonus symbols pay out £50 while the slots jackpot at 10p a spin is £90. If Madame Destiny gets involved then the power of the Oracle multiplies wins by 2. So all wins on the paytable (apart from the bonus symbol) offer a double prize if the Wild Oracle is involved in that winning line. Again, it’s the same in the free spins bonus but with pay table prizes being multiplied by 3. Halloween high rollers betting big at £50 a spin could win £10 for 2 x 9 symbols, £625 for 5 x Aces or £2,000 for 5 haunted perfume bottles. 5 x owls will net you £3,750 while 4 x bonus symbols pay £12,500. High rolling on Madam Destiny would return a jackpot of £45,000 if betting £50 a time. Again, it’s highly volatile but this is a very strong pay table. Look at some of the prizes above, a Wild Oracle will double those wins while the slots fog of time bonus will treble wins. As our most mysterious and volatile of this years top 5 slots to play at Halloween, Madame Destiny earns her place thanks to multipliers and the fog of time bonus. I’ve used to seeing Halloween free spin bonuses but not ones that can be re-triggered to the point of no limit. Don’t be afraid of the high volatility and get your palm read for just 10p. The forest might be dark, creepy, full of owls, cats and a strange Romani Wagon, but who knows what’s in store for you.